Space in Vancouver is a highly coveted commodity. Our members at the Greater Vancouver Home Builders’ Association are working on building and design solutions to support densification of our neighbourhoods, with smaller footprint homes. Due to increasing land values and building costs, affordability is a key driver in building smaller homes. Builders and designers are having to think outside the typical ‘white picket fence.’ Although higher costs may be creating challenges, the silver lining is some very clever design/build solutions. Project Mint Developments Ltd, and Nick Bray Architecture, Ovation Award winners of BC Housing’s 2018 Award for Excellence in Innovative Housing Choices for the project Anzio, know a thing or two about maximizing and designing smaller spaces. Located in a well-established neighbourhood, the Anzio project, built on a standard city lot, replaced one older home with a four-plex design featuring a full-sized. two-level residence, two affordable apartment-sized suites on the lower level, plus a 915-sq.-ft. laneway home. The result? 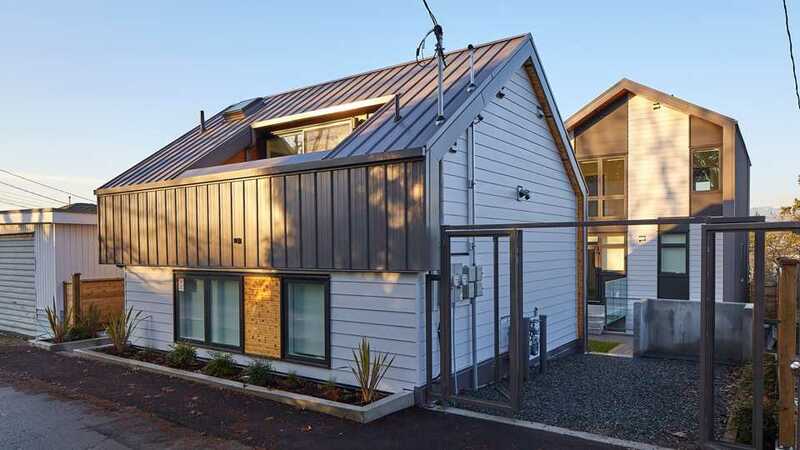 A design-friendly home with affordable housing choices, quadrupling capacity in the existing neighbourhood. Wow! RETRACTABLE WALLS: Require limited space compared to the traditional hinged door. Anzio features a frosted-glass door, which separates the living-room from the foyer/vestibule when needed. ELIMINATE CORRIDORS: Purposefully designed with no corridors, every square inch of Anzio becomes usable. This is a definite bonus to help facilitate traffic flow. COFFERED CEILINGS: Help to define a space while retaining the open, great-room layout to maximize sense of space. PLAY WITH HEIGHT: Anzio features a sunken living-room that visually delineates the eating/cooking area from the lounging space, while retaining an open concept. The added bonus? A 10-ft. ceiling in the living room area. LIGHT AS ART: Meticulously chosen lighting fixtures in Anzio cleverly transformed a necessity into an art form.